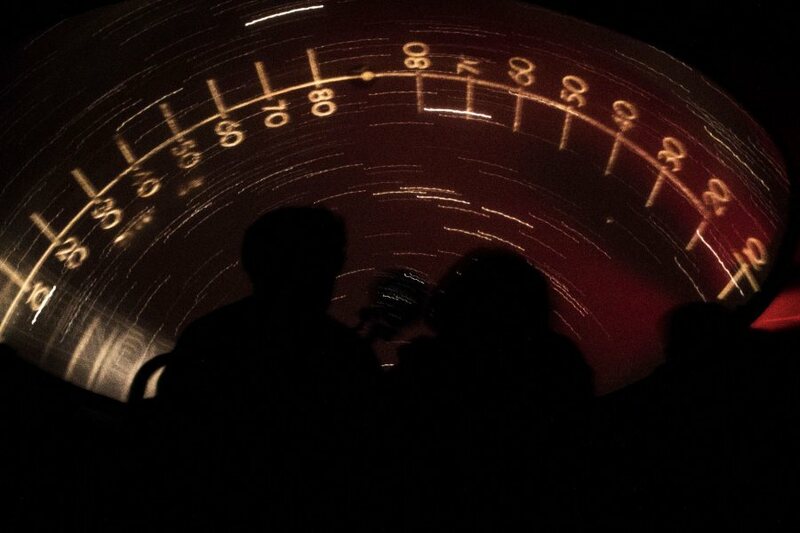 As the sun dipped behind the Chase Hall weather vanes Monday night, the young and the young-at-heart gathered outside Carnegie Science Hall for the Bates College Astronomy Extravaganza. Bright-eyed schoolchildren peered through telescopes towards the stars and listened to students in Assistant Professor of Physics Aleks Diamond-Stanick’s introductory astronomy course teach and demonstrate the wonders of the cosmos. As part of the event, hosted in collaboration with the Harward Center for Community Partnerships, Jamie Fagan ’20 of Wilton, Conn., and Daniel Murphy ’18 of Lexington, Mass., demonstrated air pressure and Newton’s laws using a stomp rocket. “We spend a lot of time learning for ourselves, but now it’s time for us to give back the knowledge we’ve learned, and we’re really happy and excited to do that,” Fagan said. “There’s nothing more exciting than rocket launches for little kids, so just being able to just spread that excitement to them has been super awesome, we’ve loved it,” added Murphy. Maeve O’Brien ‘21 of Essex, Conn., along with group partners Eliza Dunham ‘20, of New Haven, Conn., and Jill Futter ‘21 of Cold Spring Harbor, N.Y., demonstrated different types of supernovas by popping balloons. One balloon contained a ping pong ball — representing a Type 1 supernova, which results in a small white dwarf star. “Nothing really exciting,” Futter said. But the other balloon contained glitter, which burst out with the force of the pop. “When a Type 2 explodes, it’s very bright and kind of sparkly, which is a lot cooler, in my opinion,” Futter said.